Forest Of The Rain Production, Inc. invites all who believe parental engagement is a viable component in the academic success of students and schools to attend its first of a four part lecture series on Parental Engagement, Education and Student Achievement. In part one of the series entitled Expanding the Conversation on the Value of Parents as Partners: (Student Achievement, Education Reform, Advocacy and Partnership) Two panels of experts will examine parental engagement from the perspectives of schools and community based organizations. Panel one will examine how schools are promoting parental engagement by bringing local experts and emerging scholars/researchers in the area of parental involvement and education together to discuss the role of schools and school districts to promote the involvement of parents in the academic lives of their children. Panel members include: Dr. Sean B. Yisrael, Author, Educator and CEO, Educational Consultants Roxanna Olivas, Director, Office of Latino Affairs, District of Columbia, Dr. Camilla Ferebee, Educator, Virginia Public Schools, Author and Researcher, Parental Engagement and Special Education, Ann E. Chafin, Assistant State Superintendent, Division of Student, Family, and School Support, Maryland State Department of Education and Dr. Marco Clark, Founder and CEO, Richard Wright Public Charter School. The morning Keynote Speaker is Ms. Gwen Samuel, Founder and President at CT Parent's Union and Co-Founder & President at State of Black CT Alliance. The Moderator is Dr. Michael Robinson, CEO of Forest Of The Rain Productions and host of Parent Talk Live radio. Panel two will explore how community based organizations are promoting and encouraging parental engagement among parents, families, businesses and legislators. The panel consists of leading civic voices representing diversity in the methods to connect with parents and other significant role models in the lives of children. 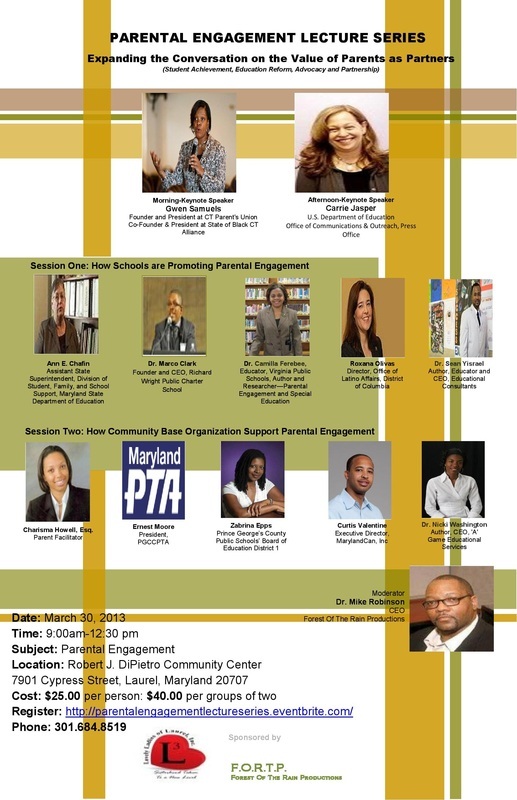 Panel members include: Dr. Nicki Washington, Author and CEO, A-Game Educational Services, Charisma Howell, Esq., Parent Facilitator, Special Education Researcher, Curtis Valentine, Executive Director, MarylandCan, Zabrina Epps, Prince Georges County Board of Education, District 1, Ernest Moore, President, Prince Georges County Council of PTAs. The afternoon Keynote Speaker is Carrie Jasper, Education Program Specialist U.S. Department of Education Office of Communications & Outreach, Press Office. The Moderator: Dr. Michael Robinson, CEO of Forest Of The Rain Productions and host of Parent Talk Live radio.